Oxford native and graduate Gemma Rose has returned from several years in Australia working at a high-powered job in the corporate world. All her money is sunk into her dream, a tearoom that she is running along with her best friend, Cassie, an aspiring artist. Things are going well even though Gemma has had to move in with her overbearing mother and absent-minded father. After all, she has hired a wonderful baker, Fletcher, and has regulars who are willing not only to help out but praise the tearoom all over Oxford. 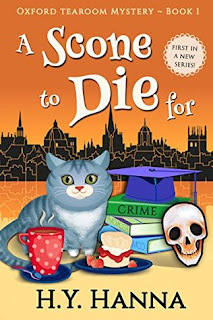 Things go very wrong when an obnoxious American tourist is discovered in the tearoom's courtyard with a scone shoved into his mouth; the same tourist who made a huge scene in the tearoom the previous day. Devlin O'Connor, CID Detective, and Gemma's former university boyfriend promptly closes the tearoom while the investigation proceeds. What's a girl to do but try to get to the bottom of the case before her business goes under? 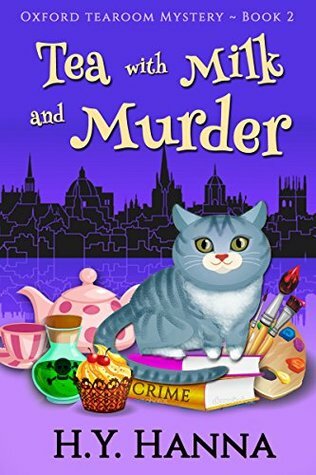 TEA WITH MILK AND MURDER begins at an Oxford cocktail party in a new art gallery where Gemma's friend and employee Cassie is showing her work. Cassie is not only the focus of the exhibit but is romantically involved with the gallery owner. Gemma does not like the new boyfriend but is determined not to interfere. When a University student collapses and dies at the party after Gemma overhears a sinister conversation, she must investigate. She thinks that the gallery owner was part of the conversation and is afraid that Cassie is going to be badly hurt. Meanwhile, Gemma's mother is causing chaos at the tearoom and trying to matchmake for her. The old sparks with Devlin O'Connor are still there but murder keeps getting in the way. A phone call in the wee hours of the morning is the beginning of TWO DOWN, BUN TO GO. Gemma's old university side-kick, the shy academic, Seth, is in trouble and needs her help. 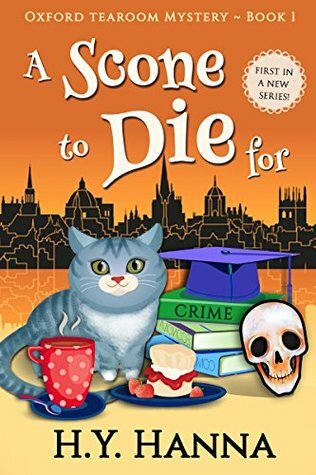 A professor has been murdered in the college cloisters and Seth is the chief suspect. The professor and Seth had a heated argument earlier in the evening and Seth was seen in the cloisters. The clues, however, point to some long buried feud at the university. Gemma and Cassie know that Seth could not have murdered anyone but things are looking bad for their old friend. 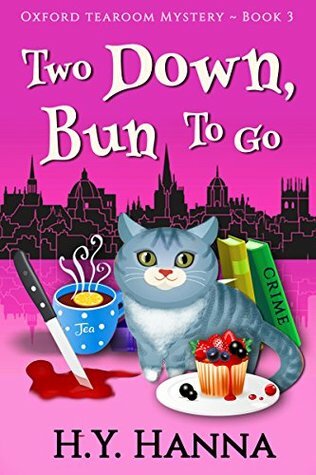 The Oxford Tearoom Mysteries are a real find. All three books are charming, quick reads with lovable characters and lots of humor. They bring back memories of my visits to Oxford with the descriptions of the city and the colleges. The inclusion of the four "Biddies", elderly ladies who like to meddle in murder are often hilarious. Another great "character" is Muesli, Gemma's mischievous cat who sometimes turns up a clue herself. Each of the books kept me guessing and thoroughly entertained. I am looking forward to the next in the series and highly recommend them.